Round Rock is a small yet rapidly growing city located near downtown Austin. Things to do in Round Rock include shopping and dining at Round Rock Premium Outlets, visiting local parks, and water activities at Rock'n River Family Aquatic Center. Round Rock is best experienced with the whole family. Check out our list of Round Rock’s top family-friendly hotels! 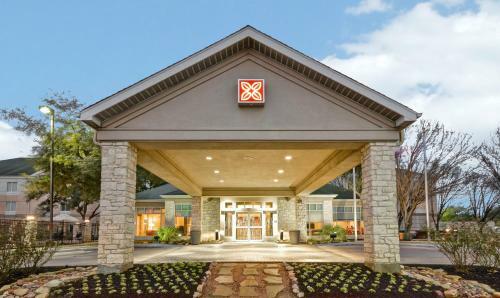 A wide variety of entertainment and family-friendly services are available at Holiday Inn Express Hotel & Suites. Guests can borrow books, DVDs, and music for children, and use the outdoor swimming pool. In the mornings, a hot breakfast is served, which includes bacon, omelets, and cinnamon rolls. Holiday Inn offers family rooms and non-smoking rooms with free Wi-Fi access and flat-screen cable TVs. Have fun splashing in the indoor pool and working out in the hotel’s 24-hour gym. On-site dining is also available. Other in-room amenities include a microwave, refrigerator, and coffee maker. Wingate by Wyndham and Williamson Conference Center is a pet-friendly accommodation, so feel free to bring along your furry friend. Families can enjoy amenities like an outdoor pool and a fitness center. Relax in rooms with a flat-screen cable TV. There are also free toiletries in the private bathrooms. Microtel Inn & Suites by Wyndham is located a few minutes away from the site of the USGP Formula One Race facility and offers spacious rooms with free Wi-Fi. Continental breakfast is served every morning. Other on-site amenities include a swimming pool and a fitness centre with exercise equipment and weights. Families traveling with their pets are welcome at Home2 Suites by Hilton, an accommodation offering an outdoor pool and a fitness centre. Rooms have a full kitchenette with a dishwasher. Other facilities include a 24-hour front desk, luggage storage, and free parking. Staybridge Suites offers spacious rooms for a family staycation. Features include an on-site convenience store, BBQ facilities, an outdoor pool, fitness center, and free Wi-Fi. Guests can also use in-room entertainment and a fully-equipped kitchen. A breakfast buffet with fresh fruit is served daily. 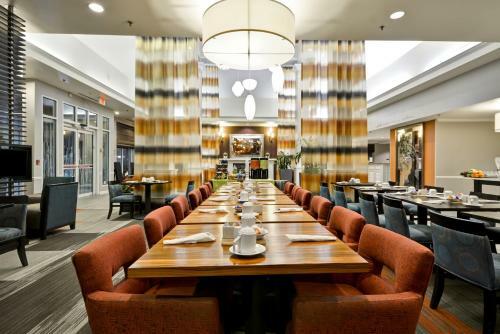 Conveniently located near Dell Inc. World Headquarters and Austin’s city center, Hampton Inn offers a free hot breakfast and high-speed internet access. Enjoy your stay in a guest room with a coffee machine and feel free to use exercise equipment at the fitness center. The hotel also features an outdoor swimming pool. 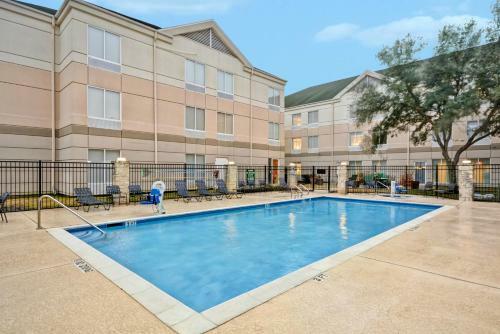 Homewood Suites by Hilton, located a few minutes away from Inner Space Cavern and Round Rock Premium Outlets, has an outdoor pool and a basketball court. Guest suites are spacious and equipped with a full kitchen. Relax on the sofa bed and take advantage of the free Wi-Fi. A breakfast buffet is also available daily. An array of fun activities await families at Comfort Suites. Enjoy a round of mini-golf, go cycling in the morning, or experience fishing. An outdoor pool and a fitness center is also included in the recreational amenities. Additionally, rooms have separate living areas with sofa beds. Hilton Garden Inn is a non-smoking accommodation, where guests can enjoy an outdoor pool and a gym. Take advantage of the free Wi-Fi access, and watch your favorite cable shows on the flat-screen TV. Other in-room amenities include a coffee maker, microwave, and refrigerator. From shopping and dining to parks and water activities, every family will surely enjoy a vacation to Round Rock, Texas. Booking a hotel that’s near your desired activities is also recommended!